Due for a fall release in 2017, Bostitch unveils plans for their new line of cordless framing and finish nailers. Each Bostitch cordless framing nailer will run on the brand’s 20V Max battery as will the finish models. The new line includes an 18 GA Brad Nailer, 16 GA Straight Finish Nailer, a 15 GA FN Angled Finish Nailer, a 28° Wire Weld Framing Nailer, and a 30° Paper Tape Framing Nailer. Each nailer is battery-powered and requires no hose or gas to operate. Although cordless, these new nailers offer many of the same features often found on their pneumatic counterparts. This includes tool-free depth adjustment and selector switches for sequential or contact actuation modes. Low nail lockout prevents dry firing and unwanted marks on the work material. They also feature tool-free jam releases to quickly clear nail jams and stall release levers to reset the driver blade in the event of a stall. All of the finish nailers have a narrow nose design for a clear line of sight and improved accuracy. They also feature multi-function LED lights to help provide workspace illumination and tool diagnostics. The Bostitch cordless framing nailers feature two variable speed settings for optimizing performance and power. Each Bostitch cordless framing nailer features a brushless motor that will improve the run time of the 20V Max batteries and the life of the tool. Bostitch claims that switching over from pneumatic nailers could save the user up to $15 per week in fuel cells. That’s over fuel cell cordless nailers, though. The switch to cordless could save the user some setup and cleanup time as well. Available in the Fall of 2017, new Bostitch 20V Max Cordless Nailer models will come packaged with a battery, charger, and kit bag. The purchase includes a three-year limited warranty, one year of free servicing and a ninety-day money back guarantee. With only a few cordless options on the market, the Bostitch cordless framing nailer models are a big deal for the company. There really aren’t a whole lot of options out there in regards to cordless framing nailers, so Bostitch releasing two models in both paper and wire collation is a big plus for the line. Since the price point for these nailers seems consistent with the other options out there, it won’t be a huge stretch to give them a shot. 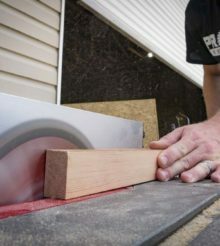 For the finishing guns, the combination of the 18-, 16-, and 15-gauge nailers address almost everything a trim carpenter might need, although there are more choices available in those categories. It would be great if Bostitch would release a cordless pin nailer and a narrow crown stapler, but those items are a bit rarer in the cordless world at the moment. Hopefully, those get released in the near future, but we’ll have to wait and see. All in all, the new Bostitch Cordless Nailer line is a welcome move from a brand with a solid reputation for pneumatic nailers. Hopefully, their experience translates into an easy transition for the end user. MSRP: $399 kitted with one 4.0Ah battery and a charger, or $319 for the tool only.